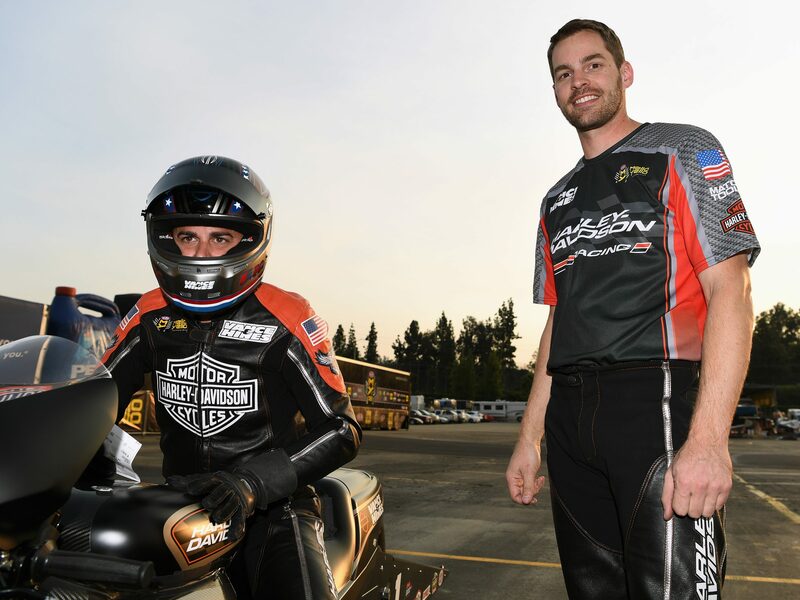 Harley-Davidson® Screamin’ Eagle®/Vance & Hines riders Ed Krawiec and Andrew Hines capped another successful season on the 2018 NHRA Mello Yello Drag Racing Series with a strong run in Pro Stock Motorcycle final eliminations at the 2018 Auto Club NHRA Finals in Pomona, Calif. Winners of nine of the last 16 NHRA Pro Stock Motorcycle drag racing world championships, the Harley-Davidson® Screamin’ Eagle®/Vance & Hines team scored four wins in 11 final-round appearances during the 2018 season racing Harley-Davidson® Street Rod™ competition motorcycles. Both factory riders qualified for the Countdown to the Championship playoffs. In one of the most-competitive seasons in the history of the class, Krawiec battled to defend his 2017 Pro Stock Motorcycle championship to the final round of the season at Pomona, but came up one win and 39 points short of claiming his fifth NHRA Pro Stock Motorcycle championship. Aboard his Harley-Davidson® Street Rod™ motorcycle, Krawiec finished the season in second place with 2,627 points and won four events (Gainesville, Atlanta, Norwalk and Brainerd) in seven final-round appearances. Hines, a five-time NHRA Pro Stock Motorcycle champion, raced his Harley-Davidson® Street Rod motorcycle to the second round of eliminations at Pomona. Hines made four final-round appearances in 2018 and finished the season in sixth place with 2,450 points. The Street Rod competition drag bikes are based on the Harley-Davidson® Street Rod™ production motorcycle, an agile middle-weight powered by the liquid-cooled High Output Revolution X 750 engine tuned for maneuvering through traffic and congestion. Harley-Davidson and Vance & Hines Motorsports created the Harley-Davidson Screamin’ Eagle/Vance & Hines team in 2002 to compete in the NHRA Pro Stock Motorcycle division. In 2004, the team was the first to win the NHRA title with a V-Twin-powered motorcycle. The Harley-Davidson Screamin’ Eagle/Vance & Hines team is led by Vance & Hines Motorsports owners Byron Hines and Terry Vance and crew chief Matt Hines, a three-time Pro Stock Motorcycle champion.